Low-Profile heavy duty aluminum construction offers quick and simple installation that integrates with the contours of the vehicle. The Delta SkyBar™ is powered by 6 LED waterproof driving lights with high-tempered glass and 150 maximum watts of power and 20,000 lumens. Comes complete with pre-terminated wiring harness with switches to operate 2, 4 or 6 lights at once. Pivotally adjusts to allow for variable beam placement for all driving condition. Delta SkyBar was specifically designed for Jeep Wrangler TJ.. It is constructed of machined Billet Aluminum mounting arms and spacers and plasma cut 13 ga. Steel cross bar holding a battery of 6 (ea) xenon driving lights. The integrated design of the SkyBar complements the roof-line and the unique lines on Jeep Wrangler. It is designed to allow garage clearance with any lifts. The bar does not interfere with any roof, soft or hard top. 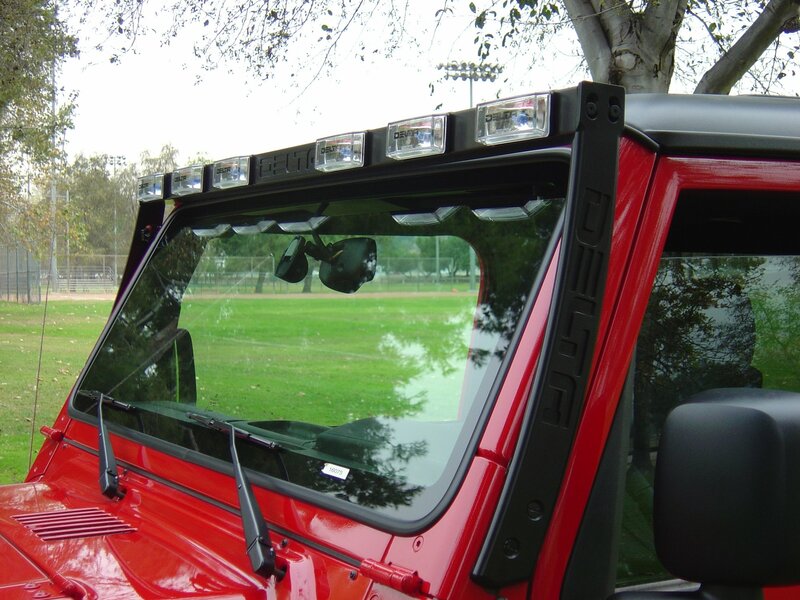 The light bar is wired to allow 3 phases of operation 2, 4 and all 6 lights. The light bar offers a precision vertical aiming adjustment. The mounting billet arms attach to the side by the windshield to existing bolt holes thus requiring NO DRILLING. The SkyBar comes complete pre-wired with an OEM double harness, two switches, relays, fuses and all necessary hardware. The mounting billet arms attach to the side by the windshield to existing bolt holes thus requiring NO DRILLING.